Sudhagad is one of the ancient forts in Sahyadri. It was the glory of Bhor state. Initially, Sudhagad was called as �Bhorapgad�. During empire of Shivaji Maharaj this fort was named as Sudhagad. This fort is approximately 590 meters in height. Sudhagad is a huge fort. It is called as the replica of Raigad. The �Thanale� excavations in this area are nearly 2200 years old. This shows that Sudhagad may be that much ancient. The construction and the geographical significance indicate that some great rulers might have constructed the fort. According to the Puranas, Sage �Bhrugu� had stayed here and he had established the temple of Goddess �Bhorai� on this fort. Shivaji Maharaj renamed Bhorapgad as Sudhagad. Later Sambhaji met Akbar (the rebellious son of Aurangjeb) in the �Pachchapur village� situated at the base of this fort. Annaji Datto, Balaji Aavji Chitnis, his son Aavji Ballal and Hiroji Pharjand were all important persons in �Ashta-Pradhan Mandal� of Shivaji Maharaj. Sambhaji has killed all of them in �Parli� village near Sudhagad. The perimeter of this fort is quite big. There are many lakes on the fort. There is a palace of Pant Sachiv on the fort, where 50 people can stay comfortably. Also there is a temple of Bhorai Devi, where 25-30 persons can be accommodated. Different kind of medicinal plants and trees can be seen in the surrounding forest. There is temple of �Bhoreshwar� near the palace. If we move further, we can see a well with a secret door. There are steps from palace to the �Bhorai Devi� temple. If we descend towards the other route, it takes us to water cisterns, which hold good drinking water. The route on the left side of these cisterns takes us towards a secret door. But this route doesn�t exist now. If we enter to the hill through this door, we come across a plateau after climbing some distance. To the left is the temple of �Siddheshwar�, storehouses of food grains, some cisterns, a lake named �Hawaldar Tale� and �Hattimaal�. On the right hand side we can see natural fortification of the fort. After leaving the palace come up with the steps and turn to right hand side of the route. This route goes through �Hatti Paga� (place where elephants were tied). It directly takes us to one peak. 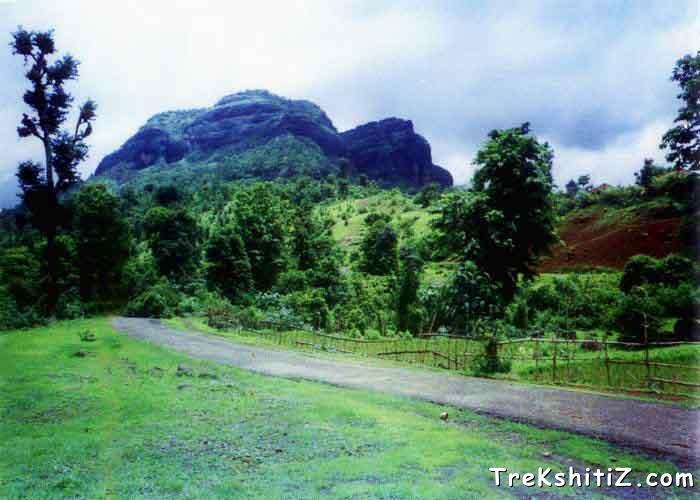 This peak is very similar to the cliff �Takmak Tok� on Raigad. From this peak Dhangad, Korigad, Tel-Baila can be seen very clearly. Similarly river �Amba� and the villages surrounding it can be seen from this place. The way from Ghat of Sawashni takes us directly to Dindi Darwaaja. This door is exact replica of the �Mahadarwaaja� (main entrance) on Raigad. The construction and arrangement of this door is of the type called �Gomukhi� (in shape of cow�s mouth). This door is well protected since it is hidden in between two huge bastions. There is one secret path well on the fort at the backside of the palace. It has one tunnel in it, but now it is dumped by mud. There is also a secret path to move down from fort in case of any difficulty. There are some tombs at the backside of the Bhorai Devi temple. We can find beautiful carvings on them. Come straight to Dhondase village from Pali village, which is at a distance of 12 km. It takes 3 hours to reach the fort from this place and the way is quite tiring. But it is straightforward; hence there are least chances to loose the way. We reach to Dindi Darwaaja by this way. Move to west from Akole village keeping Dhangad to the left. We reach Nandand Ghat within 45 minutes. Next to that there is Bavdhan village. Then move towards Pachchapur village to reach at Thakurwadi. From here we can reach the top within 2 hours. The distance between Pali to Pachchapur is 12 km, whereas Pali to Thakurwadi is 13 km. You can walk from Pachchapur to Thakurwadi. From Thakurwadi, one has to ascend by a ladder. This route is not only slippery, but also exhaustive. It takes two hours to reach to the fort by this route. This way takes us directly to Pachchapur Darwaaja. 1.Approximately 50 people can stay in palace of Pant Sachiv. 2. Even Bhorai Devi temple is good place for a stay on the fort. It�s better to make food arrangement by yourself. But if it is not possible then contact Mr. More who stays on the fort. He can make food arrangement of 4 to 5 people. There are many cisterns, lakes and tanks on the fort. Hence drinking water is available throughout the year. 2 hours by Pachchapur route.